The goal of this article series is to focus on the Tolkien based Heroclix characters, bystanders, and relics that are effective for their points, from the perspective of a player looking to play these at a non meta level tournament. Dials that are well known due to being Meta, such as Arwen or the Worker Spider will not be discussed here as their usefulness is self-evident and documented. I will, for the most part, not say “play Christopher Lee with this resource”, as all figures get better with resources, and they are not difficult to use and varied enough that the reader can decide what to use to maximize a figure best. For less than 50 points, this is quite a piece for the cost. The dial feels very much like Gollum, with his full dial of sneaky Stealth, combined with very useful and annoying powers. He’s packing a full dial of Enhancement, Perplex, and Support, balanced out with the potential cost of taking damage from using them. 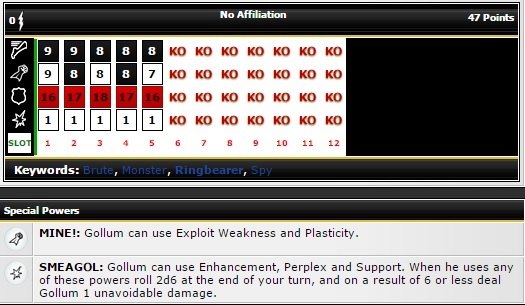 It’s important to keep in mind that Gollum makes only one roll for this power, no matter how many of the three powers he uses in a turn. Playing him on a Range based team, you’ll get your points worth from his Enhancement and Perplex alone. Then there is also his great tie-up potential. He’s got decent Defenses for the investment, which works well with tricksy Super Senses. This, combined with Plasticity and his Stealth means that opponents will have to hit him in Close Combat while he hugs them real tight so they can’t go anywhere. He also has good movement numbers to get out of a sticky situation if he needs to. The Steal Energy can make up for the damage he’ll take from his power, and with his Perplex, he won’t be hitting with less than a 9 most of the time. No matter which of his two roles you use him for, he’s quite the investment. I’d recommend him being used on a Monster or Brute team mostly, as they’re in need of the support. He could also be interesting on a Spy team as well, especially considering how many of them there are now. How I love this guy. In terms of combat values, it’s hard to argue with his consistency and solid stats, never having less than a 10 Attack and 3 Damage offensively or an 11 Attack and 2 Damage with Perplex. Even at his worst defensively, with his end dial 15 Defense, he picks up surprise Invulnerability after an entire dial otherwise lacking Damage Reducers. He is also a great team player, with top dial Telekinesis and Leadership, that turns into Outwit and Perplex after one damage, which is why I tend to push him, ignoring Willpower. He also has a decent amount of Running Shot and good speed through the dial. As far as making sure his damage output and making sure it sticks goes, he’s covered. Even disregarding his Outwit, between his Pulse Wave with high Attack Values, and his high Damage Exploit Weakness, he will be ignoring a lot of your opponent’s Damage Reducers when attacking. This leaves his Outwit to be used on your opponent’s offensive capabilities. Defensively, starting off with Super Senses for his point cost isn’t the best, but he at least has a solid 18 Defense that can become a 19 with his Perplex on the second click. The best parts of his dial have Energy Shield/Deflection, as it encourages the opponent to get in next to him, which is the best place to appreciate the sting of the Foe-Hammer. His end dial Quake synergizes well with his Defenses, as he can then attack all the foes who had based him at once, while the aforementioned surprise Invulnerability is helpful to help him buff out hits at the end of his dial. A well rounded and very interesting package. I’d play him on a Mystical team more than Fellowship, with all the options that provides. I quite like playing him with ASM046 Ghost Rider, as they add up to 300pts exactly. 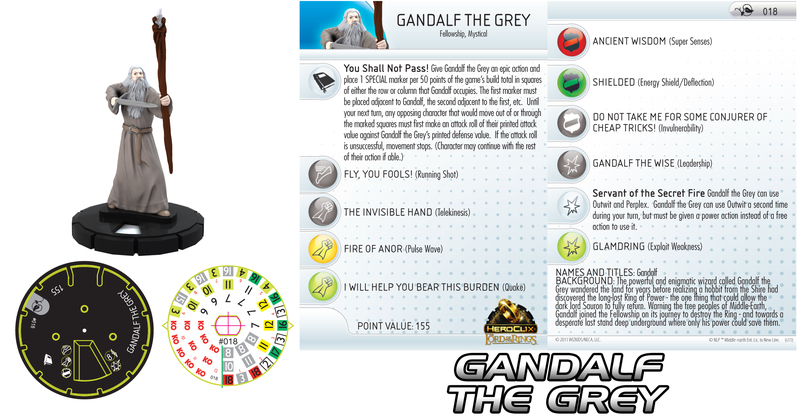 Ghost Rider carries Gandalf, and Gandalf can use his Leadership on the Spirit of Vengeance. I also like playing Sir Ian with the Omega Drive and a Thule Priest to help him with the relic roll. Hope you enjoyed this look at some overlooked clix of the Tolkien-Verse. Tune in next time for another look at some more figures. This first article is about the Batcycle (SOGV 001A) and Banshee (DP 051) and the major utility that they can bring to a team. 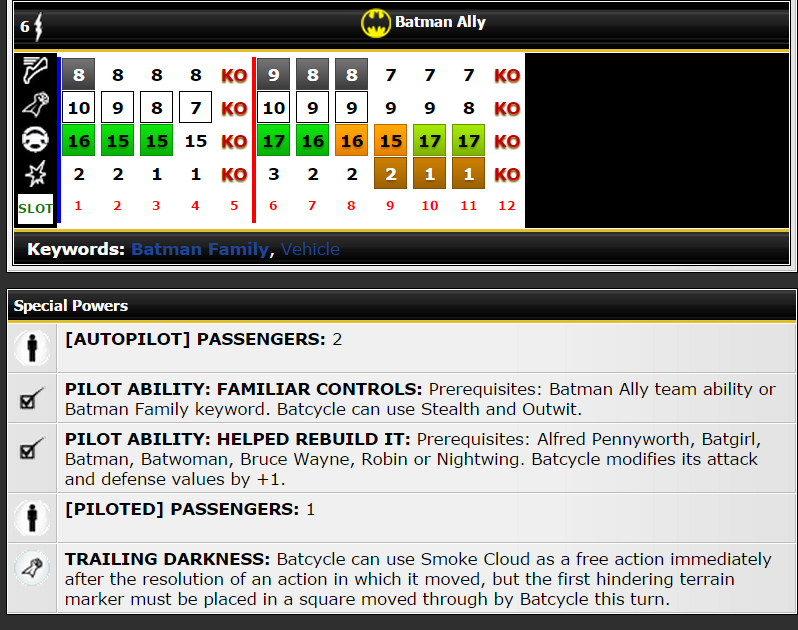 TRAILING DARKNESS: Batcycle can use Smoke Cloud as a free action immediately after the resolution of an action in which it moved, but the first hindering terrain marker must be placed in a square moved through by Batcycle this turn. That’s a great power when combined with it’s Batman Ally Team Ability and any wildcards on your team. That provides a hindering terrain bonus of +1 to any friendly characters Defense Value from Ranged Attacks that shoot through your Smoke Cloud or Stealth. Simply put; you get all that for only 25 points! To say I haven’t found these on almost every Stealth oriented team I make, would be a lie! The 50 point version has the TRAILING DARKNESS Attack Power, a higher Defense Value, a late dial Perplex, a longer dial, Running Shot on more clicks and 2 new abilities that the cycle can use when it is Piloted. PILOT ABILITY: FAMILIAR CONTROLS: Prerequisites: Batman Ally Team Ability or Batman Family Keyword. Batcycle can use Stealth and Outwit. This is a little redundant because it gives Stealth to a character who has the Batman Ally Team Ability but is handy if the Pilot doesn’t have the TA. Outwit is OUTWIT period! PILOT ABILITY: HELPED REBUILD IT: Prerequisites: Alfred Pennyworth, Batgirl, Batman, Batwoman, Bruce Wayne, Robin or Nightwing. 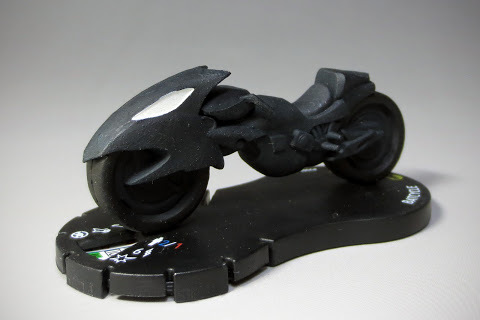 Batcycle modifies its attack and defense values by +1. Another great power if you happen to be piloting it with someone from the Batman Family. The cheapest Pilot you can give the Batcyle, that let’s you use both powers, is the 6 point HT B001 Alfred Pennyworth Bystander for a grand total of 56 points. In Modern you have only more expensive options with BM 031 Alfred Pennyworth being your best bet for a grand total of 94 points. I personally enjoy playing the Batcycle at its 25 point dial. Giving me quick early game movement, free Stealth 2/3’s of the time, and a possible 2-3 figure carry. The third being a tiny-sized figure like Despotellis. With a build like this you get pretty good protection using Stealth. Also with proper positioning you can keep Despotellis from being a target as well. Your whole team is mobile through the action of one figure. The team also works against teams who Ignore Hindering. Use your Batcycle as a shield, who cares if you kill it? In most cases the attacking figure should be within Range for a counter attack. Your counter attack should be worth more than the 25 points you lost. This team still has really good mobility after the Batcycle dies. This is because you still have Engineer who’s a flyer, Batman who’s a walker, and Despotellis that’s tiny sized. Banshee is the type of figure that you grab when you’re like, “do I really want to deal with reducers or super senses? No, I don’t think so”. 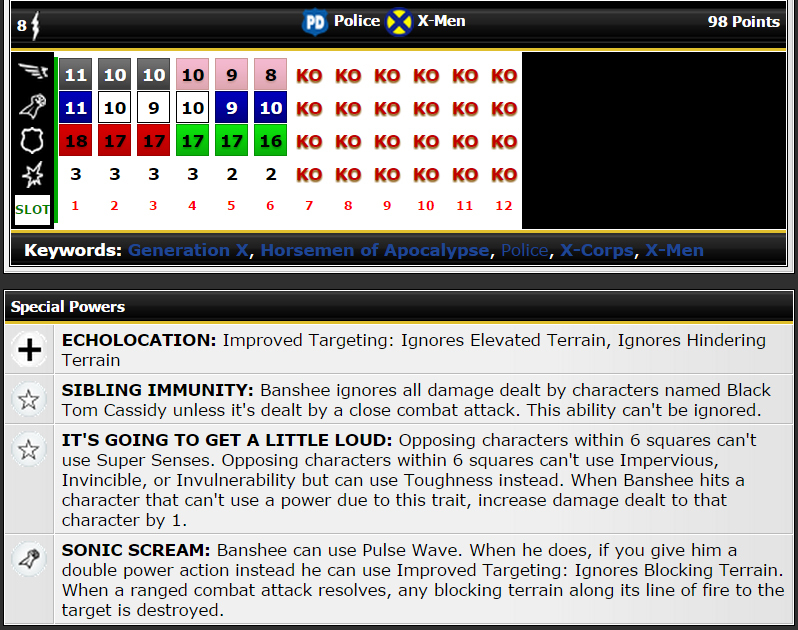 Banshee hates reducers and Super Senses so much that he not only stops you from using them, when you’re within six squares, he also does extra damage if he was Ignoring one of those Powers. OH DAYUMN! To back it up he’s got a 6 Movement Running Shot, Ignores Elevated and Hindering for Targeting, 8 Range, 11 Attack, 18 Defense. Let’s just be clear Banshee is no 200 point figure, no. He comes in at the light-weight cost of only 98 points. The only additional Power I could ever ask for in a figure like this would be WILLPOWER, but this Banshee is strong as it is and would have to cost more otherwise. Banshee at 98 points gives you some serious options when countering a Tentpole and some even more in the way of points. He’s almost a Tentpole in build with only 1/3 of your total points, NUTS! He also has a pretty good set of Keywords with: Generation X, Horsemen of Apocalypse, Police, X-Corps, and X-Men. X-men and Police being some of my favourites. If you haven’t seen the new Owlman (FFJLTW 002) he grants characters that have the Gotham City or Police Keywords the Gotham City Underworld Keyword. You know what that means? Owlman at 150, Jake Williams’ Harley Quinn at 50 points, and Banshee at 98 points make a Gotham City Underworld team at 298 points! How’s that for team building? On a serious note I think its important when using a figure like this to build with theme and get the choice of map. Ignoring Elevated Terrain for Targeting is something quite rare in the game and in many cases may make maps very unsafe for some teams to play on. Which is why I would push for anyone using Banshee to choose a map with tons of Elevated Terrain. Secondly I would suggest some kind of protection. Banshee, while being a monster on the battle field, is actually quite squishy. So bring some Barrier. Personally I like putting a Utility Belt (NML R100) on him and playing him with an Auto-Piloted Batcycle. Which gives Banshee that much needed WILLPOWER and STEALTH. If you didn’t already know it, mobility is very important, and may make a game against a figure like KC Flash a walk in the park or a ‘Nightmare on Elm Street’. Having better movement options on a map is not only important for setting up your first strike, but also important in taking map control and valuable positions defensively. Works much like the team mentioned above but with Banshee and Question being more of the shining stars as opposed to the Batman. I hope you enjoyed the first issue of The Ingredients. This week in Meta Fix Jason talks about the Trinity War chases – The Seven Deadly Sins. More Tutorials! All the Resources! Yasss! 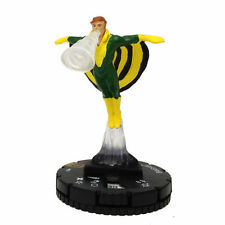 Start off your weekend right with Married With Clix and a 300pt Trinity War Sealed! This Week in Meta Fix Jason talks about how the Rock of Eternity and Pandora’s box affect the Meta Game.